Danny Gillerman was Israeli ambassador to the United Nations during the period John Bolton served as America's UN ambassador. 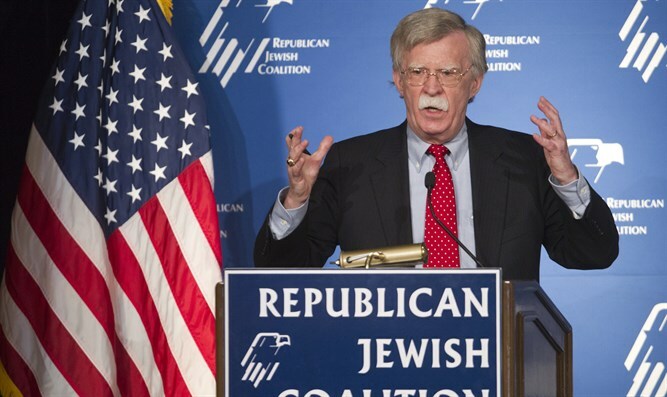 He told Yishai Shnerb on Galei Tzahal (Army Radio) this morning that whenever the UN or certain elements in the US administration formulated a resolution against Israel, John Bolton would update him so that the Prime Minister would phone the President directly to quash the threat. Shnerb began the interview recalling a statement of Bolton's that "you could remove ten stories" from the UN building, "and nothing bad would happen." "In the beginning it sounded to me like a strange sentence, but afterwards when I got to know him, I realized that the man means what he says. You can't approach him and say 'Listen, let it pass; it'll be okay, nothing will happen,' no; he has principles that are quite clear. First of all, he is truly a very, very close friend of Israel." Shnerb asked for an example, to which Gillerman answered: "Look; many times he would call me or ask me to come meet with him, and for all intents and purposes, would direct fire on his own forces. Meaning, when the State Department - then headed by Condoleezza Rice, who wasn't so friendly to Israel even though the Bush Administration was very friendly - was about to either make a decision, or not abstain, or not veto, or to advance something that was against us, Bolton would call me, and he would say 'Danny, you've got to call the Prime Minister right now, in order for him to phone the President to stop this'." The interviewer wished to make sure he heard Gillerman correctly: "Wait a second; the State Department under Condoleezza Rice advanced something against Israel, and the US Ambassador to the UN John Bolton calls you and says, 'Listen, wake Olmert so he'll talk to Bush to stop her'?" "Exactly," answers Gillerman. "Exactly; and there were many such instances. The most striking example, which by the way was made public - Olmert also writes about it in his book - during the Second Lebanon War, John Bolton and I worked together to move forward Resolution 17, the resolution that ultimately brought about the cease-fire in that war. The US supported us and I worked very closely with Bolton. The French supported Lebanon." "Do you still keep contact? Have you spoken since he was appointed Trump's National Security Advisor? ", the interviewer asks. "Yes, we also exchanged emails on Friday, I congratulated him and immediately received back a letter in which he invites us to visit him in the White House, send regards to my wife, who had a very close relationship with his wife Gretchen. Yesterday we also spoke on the telephone; he very much wanted this position. I don't know if you remember but he was a very prominent candidate for Deputy Secretary of State, when Trump was looking for a Deputy Secretary for Tillerson. But for some reason then it didn't happen. "Bolton very much wanted to be in the White House, and to implement the principles he believes in. He's waiting to enter the post on April 9th but he's already preparing for it. I think the United States got an extremely experienced diplomat who served both Reagan and Bush, he's an expert in everything having to do with nuclear weapon proliferation. He was the Deputy Secretary of State then, and Israel is receiving a true friend. "I can state this from the work he did together with me in the UN. I don't know if people are aware of this but Bolton was appointed by Bush without Senate approval, which a President can do when the Senate is in recess. Then for many months I tried to assist him together with Chuck Schumer and others to get the Senate's approval. It didn't happen, and he was eventually forced to abandon his post at the UN. But since then he's very much wanted to return to a position of influence and I think the fact that he attained it is a great gift to Israel. I think it adds great power to the American administration in face of the challenges. "By the way, he frequently comes to Israel; he participated in the latest Herzliya Conference, he met with the Prime Minister - so the relationship is very close and I think we can look forward to very fruitful cooperation with a true friend in the White House."